Discover the past, present, and future of Korea in this first U.S. exhibition to consider Korean fashion as an expression of social and cultural values. Designer Jin Teok discusses her career, the work on view in Couture Korea and her most recent collection in this afternoon conversation with fashion historian Neil Wu-Gibbs. Jin is internationally renowned as the pioneer of contemporary Korean haute couture. Her work has been included in museum exhibitions in London, Paris, and Seoul. Contemporary Korean fashion places great emphasis on the use of traditional dress and design alongside the application of modern techniques. These can include different styling methods, the introduction of new and inventive colors, creative weaving and dyeing techniques and innovative manufacturing processes to give the designs that distinct and unique edge. Korea’s most respected fashion designer Jin Teok is celebrating her 52nd year of success this year which dates back to the introduction of her womenswear collection known as “Francoise” in 1965. The trademark Jin style includes her modest yet exquisite cuts inspired by Korean culture along with artistically designed details which may consist of more flamboyant wrapping, scrunching or pleating. Her career took off in 1988 when she was commissioned to design the uniforms for the national team of South Korea in the Olympics. She was also assigned to create the uniforms for the flight attendants of the Asiana Airlines in the same year. 1990 then saw the creation of the Seoul Fashion Artists Association of which she was the president for five years. Following this, Phaidon also selected her for one of their publications about 20th Century fashion designers in 1998, the only Korean designer ever to have been chosen by this British publisher. Shortly after this, she was invited by the Chambre Syndicale to take part in the esteemed Prêt-à-Porter semi-annual international fashion show in Paris in 1993. Similarly to Gabrielle “Coco” Chanel who is known for her “little black dress,” Jin is renowned for her “white shirt” designs which have come to be seen as her signature pieces. As a child, Jin lived in Wonsan which is now part of North Korea, and it was here that she bore witness to the Korean War (1950-53). As a result of this, her family fled to the safety of Jeju Island in the South when she was just 16 where they lived in a small mud hut. One day, she noticed her brother’s white shirt drying above a window covered with traditional Korean styled paper, she said that she found the shirt hanging there to be so beautiful and mesmerizing that in her words; “was alluring, the way my brother’s shirt shined against the sunlight permeating the Changhoji.” She then went on to add that the image has stayed with her ever since, something about its delicacy and transparency along with the “crisp sound it might make when folded.” For her, this was a significant moment, one that ignited her desire to create garments and make it elegant and translucent while at the same time being able to absorb light which she thought was very beautiful indeed. This moment led to her career in fashion design, and the white shirt theme has been prevalent in many of her collections ever since. Even now at the ripe old age of 84, Jin remains very busy, her latest collections speak of new thoughts, ideas, and inspiration with their emphasis on poetic silhouettes and manipulating fabrics. I was thrilled to have a fruitful conversation with Madam Jin at Arumjigi before this event during my trip to Seoul. She kindly shared many of her personal stories with me. Today, she will share her inspiring stories with all of you! Without further ado, please welcome our guest Jin Teok! 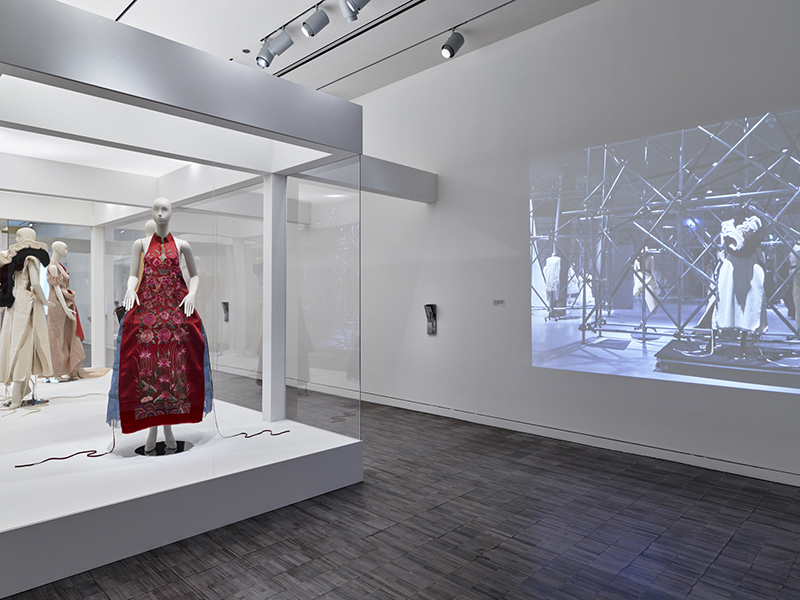 In “Between East and West,” the works in the Hambrecht Gallery transition into the present day, with creations by two senior fashion designers. Jin Teok (b. 1934) and Karl Lagerfeld (b. 1938) have searched for innovative ways to revive Korea’s fashion traditions. Both are celebrated designers of Western couture who have sought out their own distinctive and provocative ways to reinterpret Korean traditions and motifs in a contemporary and global context. Jin Teok (b. 1934), a fashion pioneer who began her career in the early postwar era in South Korea, is passionate about reinterpreting traditional Korean art and fashion. In this exhibition, five representative designs showcase her creative process in remaking the traditions of the past. Since the 1990s, when she was active in Paris and participated in several international fashion shows, she has conducted extensive research on traditional Korean clothing, motifs, and sensibility to inform her works. At times, Jin includes traditional Korean symbols, subjects, or details from paintings as patterns on her designs, or she incorporates traditional Korean motifs into Western materials, styles, and shapes. In doing so, Jin joins the visual language of the past with contemporary fashion sensibility. In 2015, the Chanel Cruise collection fashion show at the Dongdaemun Design Plaza in Seoul, South Korea, attracted enormous attention in the fashion world. Since 2000, Karl Lagerfeld (b. 1938), the creative director of Chanel, has presented the Cruise collection in various cities where he gained inspiration. Seoul was the third city he chose in Asia, following Singapore and Dubai. For the 2016 Chanel Cruise collection, Lagerfeld created designs that were influenced by traditional Korean clothing as well as by Korean artworks.